250-size quadcopter, radio control and battery. Right out of the box, it's the perfect wat to learn how to navigate! Venturing into the world of exciting First-Person-View (FPV) - Navigator is both an ideal trainer and racing platform! The Navigator features a built-in high quality camera, linked to a 5.8 GHz video transmitter. It delivers real-time, gimbal-stabilized high quality images - you'll clearly see where you’re flying! LED lights make it easy to see the Navigator's orientation, day or night. Once you feel ready, you can customize flight characteristics such as agility, low altitude control, camera tilt angle as well as functional-channel assignment via iOS and Android devices. Included as latest feature with the new Navigator firmware is the rather cool "SOS impact/ crash alert". It does help you to locate the unit after a crash. The SOS alert is triggered on impact in x- and y-axis and detects z-axis impacts as well. Out of the box, the RC EYE Navigator comes with an easy-to-change battery, attached via a secure locking mechanism that features a fast release button. The Navigator includes an emergency power-off function that will stop the brusless motors immediately, providing a balance between power and uncompromising safety. This ultra-portable, carbon-fibre and composite quadcopter features folding "arms and legs". It comes with propeller guards to protect the Navigator as you learn how to fly. The full pilot-assist offers safe, easy-to-use learning modes, including GPS navigation - leverage them until you’re ready to take full manual control. The RC EYE Navigator features 1-Axis servo control, helping you keep your Navigator and camera stable and horizontal during flight. The fully integrated and FatShark-compatible vision system delivers real-time, high quality images to your goggles or monitor - experience instant, true first person viewing! The RC EYE Navigator features GPS- and altitude-guided flying. If assistance is needed, the Software Managed Auto Return Technology (S.M.A.R.T.) helps you return the quadcopter home automatically. A 6-axis gyro and acceleration sensor provides automatic flight stabilizing. The 8-channel fully proportional 2.4 GHz transmitter includes automatic digital frequency hopping. Real-time telemetry data is visible on an easy-to-see LCD display, making the Navigator simple to maneuvre and operate. 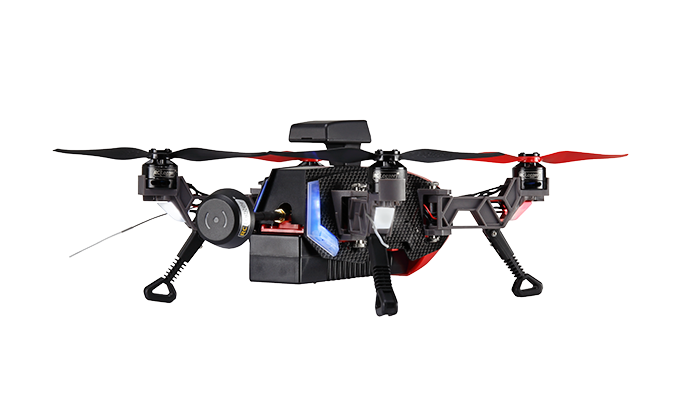 Constructed out of lightweight yet, durable carbon fibre and composite material, this quadcopter features folding arms and landing gear for easy storage and transportation. The removable propeller guards protect your Navigator, making it ideal for first-time pilots wanting to safely experience the excitement of FPV or while flying through densely-wooded areas. GNSS: Advanced GPS, GLONASS, Galileo, BeiDou, QZSS and SBAS Global Navigation Satellite System. Allowing to establish a stable and precise X/Y-axis position hold as well as return to home. Position hold, in combination with Z-axis altitude height hold, is typically applied during aerial photography applications. Further GNSS allows recovering or locating your unit in case of an emergency. R.T.H. : "Return To Home" is a failsafe feature allowing the Navigator 250 to fly back to its original take-off position in the event of a signal loss or pilot trigger. S.M.A.R.T. : The "Software Managed Auto Return Technology" function provides App based simple user configuration options allowing pilots to set home location parameter through mobile devices via Bluetooth connectivity.